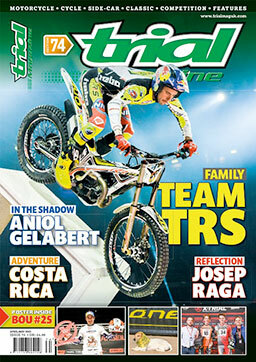 It’s that time again for all the subscribers to Classic Trial Magazine, Yes Issue 11 is here in full colour gloss. Inside you will find all your Trials News, Action, Events, Tests and so much more for you Classic – Retro addicted trials junkies who need the motorcycle Christmas fix. Park your feet up sit back and enjoy the read! Classic Trial Magazine in Print – We are proud to be in print and using new material and unseen images from the very best photographers in the world. Remember Classic Trial Magazine is only available on subscription or why not download from the new App and have the best of both worlds! Picture Archive: The 100 Year celebrations of the Scott Trial are still fresh in everyone’s mind and so we look at the years 1989 – 1994 ‘Air to Water Cooling’. Test: We ride with ‘Vesty’ as he test rides his last Bultaco in a lovely location. Legend: Who won the 1966 SSDT and Scott Trials – Alan ‘Sid’ Lampkin a true legend of Off-Road Motorcycling. Best of British: CCM/Armstrong gave us both four and two-stroke machinery for the trials market, the story is very inspiring. Flashback: Did you know John and Dougie Lampkin own Bultaco machines. Product Focus: The Mots ‘Rover’ pant is in the spotlight. Classic Machine: The Gordon Farley developed Suzuki RL. Sport: Classic action from around the Globe. 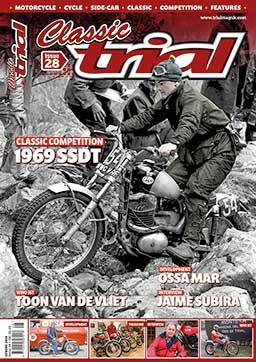 Celebration: Classic Trial Magazine was invited to the Scott re-union dinner. One Moment: Mick Andrews and the ‘Cantilever’ Yamaha at the 1974 SSDT. Workshop: Replace your front wheel bearings. Classic Competition: Who remembers Geoff Parken and his 1974 BTC win at the Victory trial? We do! Make sure you don’t miss out and get yourself a subscription by contacting Classic Trial Magazine: Mail: lisa@trialmag.com – england@trialmag.com or telephone: 01663 – 744766 (Between: 10 – 3 O’clock) Please be patient when calling.